Pete Hamill’s novel, Snow in August, is beautifully written, poignant, insightful, filled with bits of humor, and a story that captures the essence of friendship, during the post Holocaust years. I read this book about ten years ago, and reread it recently. The friendship between Michael Devlin, an Irish Catholic eleven-year old altar boy, and Rabbi Judah Hirsch seems like an unlikely match, yet their friendship develops into a strong bond, with ties that bind themselves to each other in more ways than one. They met during a snowstorm, when Michael was walking to church, and perform his altar boy duties. It was a Saturday, the Sabbath for Jews. Michael heard the Rabbi call him asking for help. Rabbi Hirsch wanted Michael to turn on the lights for him (he couldn’t do it, as it was considered work). From that day forward, Michael becomes Rabbi Hirsch’s Shabbos Goy. Through this initial meeting, their relationship develops. Michael teaches Rabbi Hirsch English, and teaches him about baseball, as the Rabbi wants to be as Americanized as possible, within his realm of Judaism. Rabbi Hirsch in turn teaches Michael Yiddish, Polish history, and teaches him Kabbalah. He also teaches Michael about the legendary Golem, and the Golem’s purpose. Both Michael and Rabbi Hirsch learn from each other, and learn eagerly. Michael’s father was killed in WWII during the Battle of the Bulge. Rabbi Hirsch’s wife died in the Holocaust. Both boy and man are seeking acceptance, and seeking friendship in Brooklyn, during the late 1940s. Their common ground is baseball, with the advent of Jackie Robinson being signed on by the Dodgers, breaking what was then defined as “the color barrier”. Michael loves baseball, and Rabbi Hirsch is intrigued with the fact that Robinson was going to be playing for the Dodgers. The Rabbi could relate to the fact that Robinson was an outsider, yet he managed to break boundaries. Being Jewish during the 1940s certainly made one an outsider, and Rabbi Hirsch was trying to fit in in Brooklyn, while leading a synagogue. Jackie Robinson became a symbol for both Michael and Rabbi Hirsch, a symbol of overcoming adversity, a symbol of succeeding in a world of repression. Michael was coming of age during a period of time when many of the Irish were looked down upon. He was being raised by his hard working mother. His passion, aside from baseball was Marvel comic books, and super heroes. In his neighborhood their were gangs, and one gang was called The Falcons, and was run by a no-good hoodlum named Frankie McCarthy. Frankie hated Jews, and stopped at nothing to inflict damage and pain on them. Michael witnessed a horrible incident involving a Jewish store owner. Michael’s Irish background frowned upon anyone informing on another person, even if that person committed a terrible crime. Therein lies the dilemma that he faced. He had to conjure up super strength and power in order to set things right, in order to overcome the evil that was present in his life. He had to oversee and make sure that the person who committed the crime paid for it. Justice had to be served. Michael had to try to become a super hero, himself. Reading Snow in August brought back memories for me, of early 1950s Brooklyn. Hamill certainly knows Brooklyn’s history, and I could envision the scenes he painted, as they were so realistically written. Snow in August is an excellent book, brilliantly written by Hamill. He infuses solid Brooklyn postwar history within the pages, not coloring over the hardships of tenement living within the confines of poverty, of gangs, and racial and cultural differences. Religious discrimination is a prominent theme of the book, and Hamill illuminates Jewish practices and traditions, and includes the mystical aspects of Judaism in the novel. The relationship between mother and son is deeply felt, evoking emotions within the reader. Snow in August is a story of survival, survival of the fittest, in a world of religious and racial hatred. It is a story of overcoming the odds, and of overcoming adverse situations. But more than that, it is a story of a deep friendship between two improbable individuals. It is a soulful and heartfelt novel, filled with reality, fantasy and magic. Once I began it, I couldn’t put the book down until I finished it. I was completely involved in the story line. Pete Hamill’s Snow in August is a masterpiece, written by a master. One can visualize each situation through his vivid word images. It is a book that involves the reader from the beginning. The beauty of the novel is the brilliance of the author. I highly recommend Snow in August to everyone, whether they are Jewish or otherwise. I am so behind on my blogging. And, the main reason is that I have been reading, reading, and reading some more. Most of what I have read this past week are books I could not put down once I started them. Of course some of the reality of life’s moments have kept me extremely busy, also. Daniel Deronda, by George Eliot is a novel that takes place during the Victorian time period. The era is important due to the social mores and standards of the time period. The two main characters blend within their lifestyles, ever aware of their standings within the societal realm. Daniel Deronda, has been a ward, since early childhood, of the wealthy Sir Hugo Mallinger. Daniel, along with others in Mallinger’s social network, believes that he is Mallinger’s illegitimate son. Daniel is a sensitive man, and often ponders on his birth, and whether his true heritage lends him to actually being a true English gentleman. During his travels and his wanderings he finds himself in the company of Jews. Within his involvement with the Jewish community, he feels a strong bond, feels comfortable within their realm, and feels a sense of commonality. Gwendolen Harleth is the other main character, and she is a self-absorbed individual. She thrives on manipulating others to suit her gain. She is proud of being able to control men with her feminine charms. A blink of her eyes causes men to be enamored of her. This is how she has maintained her standing within her social life. All that comes to an end all too soon, for her, as she is faced with the fact that her family is going bankrupt. This causes her to take a stance in order to support herself and family. She eventually gives in and marries a man named Henleigh Grandcourt. She feels that she managed to control him to her beckoning, but little does she know that the reverse situation is, in actuality, the truth. He has manipulated her. She becomes aware of this, and in the end, finds herself feeling extreme guilt over circumstances surrounding her husband. 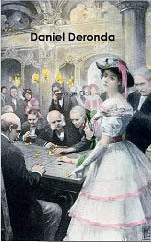 She befriends Daniel, with full display of gaining his attention, in her manipulative manner. He thinks of her constantly, yet, his heart is with Mirah. He tries to ease out of contact with Gwendolen in a sensitive manner. Daniel Deronda is a brilliant novel, and the characters are all depicted vividly, with all of their flaws and attributes. Even the more minor characters are not so minor, truth be told. For instance, Mirah Lapidoth, a young woman on the brink of suicide is saved by Daniel just as she is about to jump into the Thames River. From there begins a relationship based on mutual respect and admiration. Mirah is Jewish, and therein lies Daniel’s initiation and into the Jewish community, its strong traditions, and also its secular offshoots. Mirah has run away from her father, and has ended up in London searching for her long lost mother and brother. Daniel’s sympathies has him striving to help her find them, and help her begin a new life. Throughout all of this, he finds himself falling for her, romantically. Daniel is consumed by Judaism and its ideals, and feels completely comfortable in Jewish surroundings. He can not stay away from the Jewish section, and has cemented himself within the Jewish Quarter with his contacts. His comfort level is fostered by a man named Mordechai, a man of great vision. He practices Kabbalah, and his dreams take him to places others have not traveled. He instills in Daniel the fact that Jews need to have their own homeland, their “Promised Land”. He tries to encourage Daniel to take over his (Mordechai’s) efforts once he has died. He is a sickly man, a man with little time left in life. Daniel is influenced by him. The Jewish factors are quite prevalent within the pages of Daniel’s story. His curiosity regarding Judaism is never lost on the reader, and is enhanced through Eliot’s masterful writing and rendering of Judaism. His ever need for knowledge regarding Jewish life and traditions is evident, and written with conciseness and accuracy. Eliot certainly did her research, and considering the fact that Daniel Deronda was published in 1876, her research entailed a lot of physical work in gaining access to documents and records from libraries to public records, to consultations and so much more. The internet was not even a gleam in the eye of the writer of that era. Considering those factors, Daniel Deronda is a masterful historical novel, a novel that speaks of Judaism in every sense of it, from religious affiliations, to life styles, to food and culture, and so much more. The majority of the novel is mainly about Gwendolen, and about the upper crust of England. A reader could be put off by the title. Gwendolen’s arrogance and self-absorption sets the stage for a more serious tone to come. The Jewish society is a separate one, although a social setting of its own, within the scheme of whole of society and location. It is a totally different concept than the upper class of England. Once Daniel’s character takes root, it is clear that the story line of Gwendolen, has been written to lead up to the main point of the novel, the Jewish question, the Jewish factor, and the concept of Zionism. Yes, that is correct, Zionism. Imagine, Eliot, a woman of her time period, considering the varied Jewish theories, including the concept of Zionism, and not only that, writing it into the novel, Daniel Deronda. She was a woman whose ideas and theories were spoken of within the pages of Daniel Deronda with precision and accuracy. She was a woman whose standards and ideals were ahead of her time, so to speak, and it reflects in her writing. I was extremely absorbed within the almost 800 pages of Daniel Deronda. The length of the book had nothing to do with my desire to continue to read it through to the end. I found it fascinating, enthralling and compelling on so many levels. Eliot’s brilliance and perseverance in penning a novel filled with history, social opposites, ideals and mores, and with a few characters that matter to the reader, is astounding. Her respect for Judaism and its ideals and traditions is made quite clear. Her passion for truth and understanding is evident within the pages, especially within the last third of the novel. I applaud George Eliot for her strength and ability to portray individuals, not only at their worst, but at their best, and portray them with religious sensitivity. Daniel Deronda, is an extremely ambitious novel, filled with historical brilliance through excellent writing. I will be reading it again, this summer, because I know that there are areas within the story that I will want to gain more from through the rereading. Once is not enough, at least for this reader. I highly recommend George Eliot’s Daniel Deronda. The Earth and Sky of Jacques Dorme, by Andrei Makine, translated from the French by Geoffrey Strachan, is a vividly depicted story. Makine’s novel is the third in a trilogy of books, that are more or less biographical. Time and place are innate and important qualities in his romantic and almost surreal writing. Those words encompass the very essence of the story line. Makine is brilliant with his visuals that flow through the pages with the utmost of illumination, grace, insight and intensity. He is a master story teller of romance, longing and loss, and this book is no exception. A French fighter pilot named Jacques Dorme, and a French nurse, named Alexandra meet in Stalingrad, in May 1942, and begin a short-lived physical affair, but one that lasts indefinitely in their hearts. Through the destruction and devastation of Stalingrad, and within its ruins, their love story begins. They have little time together, but those moments and memories bind their hearts eternally. Jacques Dorme leaves for Siberia, where he eventually pilots a plane. Before their meeting, Dorme was a prisoner of war in the east. The narrator of the book, was somewhat imprisoned, also, both emotionally and physically. The narrator is a Russian war orphan, who has received comfort from a woman named Alexandra, and what he feels is similar to parental love, through the interactions of a weekly Sunday visit to her ruined home. The visit is his weekly outlet from the confines of the orphanage. He has been told that she knew his parents. There he manages to break through a wall, into a vacant apartment filled with books, and manages to teach himself French, the native language of both Jacques and Alexandra. The narrator is eventually exiled to France, and from there, decades later, tries to find his roots by returning to his motherland in Russia. The narrator’s story and life is supposedly taken largely from Makine’s own life experiences. Andrei Makine’s brilliant and beautiful prose is set against a harsh background, both in its indigenous, environmental elements and the elements of love and war. His metaphors for yearning and loss are vivid images that tear at the emotions of the reader . His work is masterful. 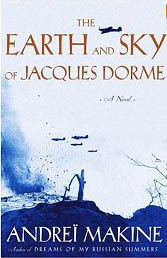 I recommend The Earth and Sky of Jacques Dorme to every one. Rashi’s Daughters, Book III: Rachel, by Maggie Anton, is a well-written and well-researched historical novel, filled with beautiful imagery, and imagery that is often brutal. The novel is filled with intrigue and historical data from the Medieval period, but also contains much information about the Jewish Talmudic scholar Salomon ben Isaac, otherwise known as Rashi. From the moment I began the first page, I was enthralled, and continued reading until I was finished. It was difficult to put down, on the few occasions that I had to. Within the pages emerges a family tapestry of Rachel and her place within the familial unit. She was the youngest of three daughters…and according to much scholarly information, including the content in Rashi’s Daughters, Book III, she was not only the youngest, but Rashi’s favorite daughter. She had a way of winning his heart, and the heart of her beloved, Eliezer. She and Eliezer marry, and settle in Troyes, France, near her father. Much to her dismay, Eliezer is constantly away for months on end with business dealings and ventures. It seems whenever he is away, something dreadful occurs, whether it be to her or her family, or to Eliezer. Rachel is a woman at odds with her husband’s departures, and although she is strong, it wears on her. One of Rachel’s greatest traits is her strength, strength under adverse conditions, and strength under extreme pressure. Her courage and powerful mindset during the time when the First Crusade of the Middle Ages basically annihilated all the Jews in Germany, is unsurpassed, and vividly portrayed. She is forthright, passionate, and a woman of clarity and responsibility. She was a businesswoman, constantly seeking new ways of earning money in order for her husband to fulfill his business endeavors close by, and not have him traveling far from home. One such goal is to open a woolen business, and her thinking is she will earn enough to keep her husband working nearby, and not traveling so often, if at all. Anton fills the pages regarding Rachel’s interactions with those who can instruct her. She is an eager and avid learner (a trait that Rashi instilled in her)and she is constantly trying to find those who can teach her, and work for her. The book is filled with amazing word paintings. The images are incredible, and it is as if we are there witnessing the event/s. I was fascinated by the entire procedure, from mating of the sheep so the wool will be the finest, to the shearing of the sheep, to the finish of the final product…everything is detailed down to the minutest job and endeavor. During the First Crusade, when the Jewish population was massacred and destroyed, Rashi and his family never thought it would come to the point that the Crusades would reach them in Troyes. Her heroic actions trying to keep the family safe fill the pages, and her willingness to do what is ethical and moral is never questioned. She is there every step of the way. Anton delivers the punches and the forcefulness of the time period vividly, and the book is historically compelling, and a masterpiece. 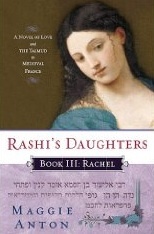 Rashi’s Daughters, Book III: Rachel, is an amazing accomplishment. Anton is overwhelming in her competence to write historical content, and in her ability to keep the reader’s interest. There are so many awe-inspiring moments, moments that shock the reader. The book flows, from one scene to the next with superb illuminations and brilliant descriptions. She is a master at portraying, not only the Medieval/Middle Ages time period, but in depicting daily life under the harsh conditions of the 11th Century. It was a struggle no matter how you perceive it, but add the Crusades to the structure, and life and what those around Rachel considered to be “normal”, quickly debilitates and diminishes. Like father, like daughter, Rachel learned from a master, and she was no less a master, herself. During a time when women were kept on the sideline, she made sure she was in the forefront of current events. She watched them unfold before her eyes, and Rashi, her sisters and the other family members, were concerned for humanity, for the injustice that surrounded their environment. The pages flow with that very ideal. Rashi’s Daughters, Book II: Rachel: A Novel of Love and the Talmud in Medieval France is the third, and the last sequel in a trilogy by Maggie Anton. It is a beautiful testimony to Rashi and his teachings, his care for all individuals. But, more than that, it a magnificent testament to Rachel and her endurance, fortitude, caring, and concern for humankind, during a crucial and horrific period in history. I highly recommend this well-written historical novel to everyone. It is writing at its excellence, and a brilliant novel, in my opinion. Bravo! 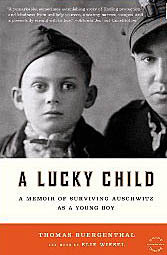 A Lucky Child: A Memoir of Suviving Auschwitz as a Young Boy, by Thomas Buergenthal, is a book I have added to my Holocaust memoir library. Buergenthal didn’t disappoint me. It is not only a Holocaust memoir, but one written more than six decades after the fact, from the perspective of his childhood memories, and memories of his parents and friends, and memories of others he encountered throughout the years. Some might say that although he was born in 1934, and managed to survive the Holocuast, his memories might be colored by his youth and by time. To some degree that could be accurate, and Buergenthal acknowledges that in the Preface of A Lucky Child. Nonetheless, faded memories and recollections, or otherwise, this is a compelling Holocaust memoir, infused with details of life before the Holocaust, life during the Holocaust, including work camps, concentration camp life, and life after liberation. That Buergenthal, beginning at the age of eight, managed to survive and bear witness is an incredible feat in and of itself. Some may ask why he waited so long to tell his story. In my opinion, that is not for us to question. Events of the past definitely tint our lives and perspectives. What some are eager to convey, others are eager to let recede into hidden compartments of our minds. We must remember, Buergenthal was a young boy, a boy who lived through the horrors of the Holocaust, the demeaning, adverse and harsh living in the ghetto and in concentration camps, and was just into his teen years when liberation by the Soviets occurred. Buergenthal has painted extremely descriptive word images of his experiences. He has given the reader an intimate look at daily life in concentration camps, including Auschwitz. Within the appalling situations, there are little snippets of humor, of man’s kindness, and of the fight and strong will to survive, survive in order to be reunited with his parents. Thoughts of Buergenthal’s parents are what kept him motivated through the hours, days, weeks, months and years. A young boy learned the ropes, so to speak, the actions that were necessary in order for him to survive. He witnessed things that would make adults shudder, and here he was, a child, having to endure the fears and agonies of the Holocaust. Yet, throughout everything, he managed to rid himself of hatred. Within the atrocities and the adversity, there were moments of poignancy, where even the offender acted with humaneness, most likely due to sympathy for Buergenthal’s age, and the situation he was thrown into. He became a mascot of sorts, for Polish army troops, and was treated with affection and kindness by them. Within the agonizing days, he moved through life with a positive attitude, due to his dreams to believe he would be reunited with is family…their memories gave him strength to continue to survive as best he could. Within Buergenthal’s survival techniques, he managed to become a person of depth and good character. His youth gave him opportunities to interact with the Nazis and with the Jews, opportunities that proved fruitful to his survival. He used every moment to advance his cause, yet through it all Buergenthal remained true to the ideals, ethics and morals his parents taught him. How inspiring. I read it in one day, and was unable to put it down for very long, without going back to reading it. A Lucky Child is a compelling, poignant, inspirational memoir. Thomas Buergenthal’s portrayal of ordinary human beings, both good and evil, is not to be missed. It is a beautiful story, and one that is extremely illuminating. His story defines what life and survival is all about, and the importance of family within the confines of horror. Buergenthal was a lucky child who became a forthright, honest and sensitive adult. The memoir is one of great historical value. I highly recommend A Lucky Child to everyone. In my opinion it not only belongs in every personal library, but in the libraries of all educational institutions. As an added piece of information, Thomas Buergenthal’s experiences during the Holocaust shaped his life in more ways than one can imagine. He “has dedicated his life to international law and the protection of human rights.” His experiences have lent him the insight and intensity necessary to oversee and empathize with not only Holocaust survivors, but the rights of all individuals, no matter their ethnicity. This lucky child has brought, and given, luck to other individuals through his humanistic efforts. © Copyright 2007 – 2013 All Rights Reserved – No permission is given or allowed to reuse my photography, book reviews, writings, or my poetry in any form/format without my express written consent/permission. The Language of Flowers, by Vanessa Diffenbaugh, was an enjoyable read for me, capturing the essence of flowers, not only in their physical attributes, but also in defining them. Within the scope of defining them, lies a story of youth and growth within the foster care system, focusing on the main character, Victoria. Victoria has had a hardened life, being transported from one home to another. When she turns eighteen, she is thrust out of the foster care system, and must learn to tend for herself. She leaves a halfway house in a state of disillusionment and anger, and from there begins the story of her adjustment into society. Flowers have become a passion of hers, not only for their beauty, but also for their sentiment and meanings. A former foster mother taught her how flowers speak, and how each flower has a message of its own. Each flower, according to Victorian standards, has its own definition, and during the Victorian time period, flowers were given to someone in order to convey a specific message. Victoria finds this concept fascinating, and goes about the task of creating her own project of defining flowers, photographing them, and sometimes drawing them. I know I am being a bit vague, but in order to encapsulate the story line of The Language of Flowers, without giving it away in its entirety, I have to use less clarity than I might otherwise use. Victoria manages to find work at a florist, and is able to exercise her creativity to its fullest in arranging flowers to suit a particular emotion, mood or event. She becomes respected and highly regarded. During the processes of creation, she begins to grow emotionally, and slowly begins to understand her background and the choices made by her mother. She also begins to mature within social situations, and is able to handle some of her impulses. I enjoyed the aspect of reading about flowers and their meanings, and how they were used within the pages of The Language of Flowers, to bring comfort to those who received them, and to those whose life event was enhanced by them. I was fascinated by the logical and emotional definitions of the flowers, and how they related to life. I liked the fact that there is a glossary at the end, displaying the names of flowers and their definitions. Vanessa Diffenbaugh was brilliant in conveying flowers, their meanings, and their illuminations within daily living. Her word images were strong and filled with essences for all of the senses. 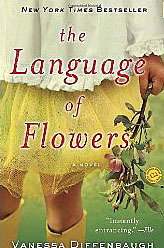 The Language of Flowers would make an excellent “beach read”. I would give it three and one half stars, with five being the highest.